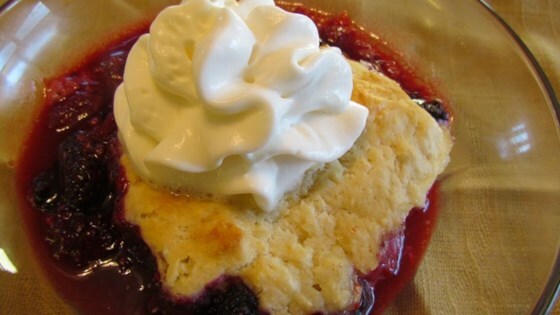 "This cobbler has a traditional drop-biscuit topping. You can substitute raspberries for half of the blackberries." Toss the blackberries with 1 1/4 cups sugar and 1 1/2 tablespoons flour in a mixing bowl. Spread into a 9x9-inch baking dish, and dot with 1 1/2 tablespoons of butter. In a separate bowl, whisk 1 1/2 cups flour together with baking powder, salt, and 2 tablespoons sugar. Cut in the softened butter until the mixture resembles cornmeal. Stir in the milk and egg until combined. Drop the batter over the berries by the spoonful. Bake in the preheated oven until the fruit is tender and the topping is golden brown, 20 to 30 minutes. This was VERY easy, quick, and, (best of all) very tasty. It's a "keeper" in my recipe box ! Very delicious! I'm not sure if the berries should have set up more or not, but it didn't matter. We had it warm with ice cream and it was heavenly. I love this recipe, it is simple and very tasty. I will make it one of my favorites. This was excellent! My family, 2 boys 7 and 10 and my husband all enjoyed this very much. It is a definite repeat.